What can be done to get more women in positions of leadership in the fitness industry? Helen Durkin, J.D., IHRSA’s executive vice president of public policy, has some ideas. Many years ago, I sat at a table and listened as men discussed how the health club industry was a great industry for women to work. I didn’t enter the dialogue, but I wondered—if it was true, why was I the only woman in a meeting of industry leaders to hear it? 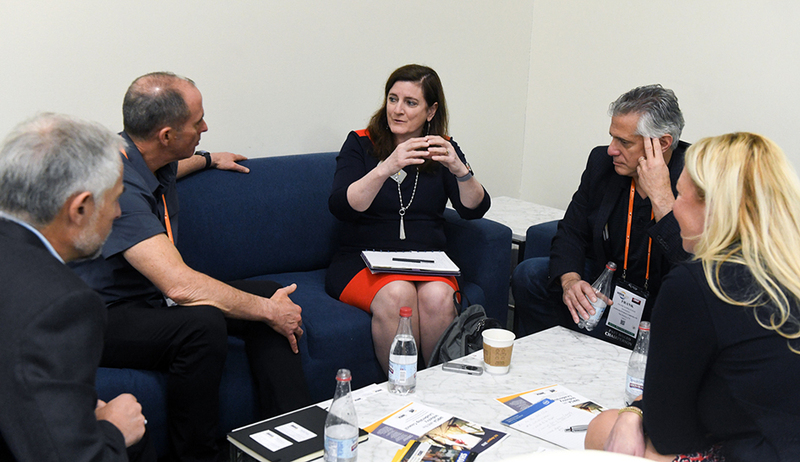 Durkin speaking with Industry Leadership Council members at IHRSA 2018. A Harvard Business Review (HBR) article points out that the barrier to more women in leadership is not a glass ceiling but a labyrinth of leadership. The article notes, “Passage through a labyrinth is not simple or direct, but requires persistence, awareness of one’s progress, and a careful analysis of the puzzles that lie ahead. ... For women who aspire to top leadership, routes exist but are full of twists and turns, both unexpected and expected.” There are many obstacles in the path forward, but let’s focus on three ways to navigate those obstacles. 1. Let’s talk about the twists and turns we face as women. For many of us, we felt so lucky to be there that we didn’t need to or want to rock the boat. When I graduated from law school, I worked on a political campaign and then as an associate in a labor law firm. I thought we had come so far from the days of our first jobs out of law school being legal secretaries like that of former Supreme Court Justice Sandra Day O’Connor. It wasn't until I started writing this piece and reflected on past IHRSA Global Leadership Summits that I realized the vast majority of people who come to this event are still men. Even though I am no longer the only woman in the room, there are still too few women in attendance. Is the work at Nike done? I’m sure it is not, but their actions got the conversation started. Talking also helps you identify the subtle and invisible barriers that get in the way of women seeing themselves as leaders. I was once in a meeting in Washington, D.C., to discuss creating a coalition to fight what would eventually become the physical inactivity crisis. Important stuff. When it came time for a break, a very senior male in the room turned to the only lawyer and woman in the place—me—and asked me to get coffee. While I don’t recall if I got the coffee or not—I distinctly remember an internal debate that said, on the one hand, lighten up it was just an innocent request, but on the other hand, do leaders get everyone coffee? And, by getting coffee, would I diminish others perception of me as a leader? The consultant that we hired to facilitate the meeting helped me settle the debate. He apologized for the other man’s actions and commented that the man did not realize how that request undermined the work he wanted me to do. He then offered to talk to him. I don’t know what he said but I was never asked to get coffee again. 2. We need to foster safe spaces to talk about the subtle biases that hold us back. Several years ago, a woman who worked for me was dealing with the challenge of returning to work after maternity leave as a mother to three kids under two. As a woman with a full-time demanding career and two kids myself, I had purposefully talked to my staff about the challenges of doing both. Those conversations helped create a safe space to talk about my employee's needs without worrying about negative ramifications. Because of that, we were able to come to a solution that enabled IHRSA to hold on to a very valuable and productive employee, and the employee got to continue to do the important work she wanted to do. One of the goals for the upcoming IHRSA Women’s Leadership Summit is to create that safe space for conversations and developing relationships that build a community of women in the industry that can serve as sounding boards. 3. Don’t forget to make time to build your social capital and network. Durkin leading a meeting during the IHRSA Institute. 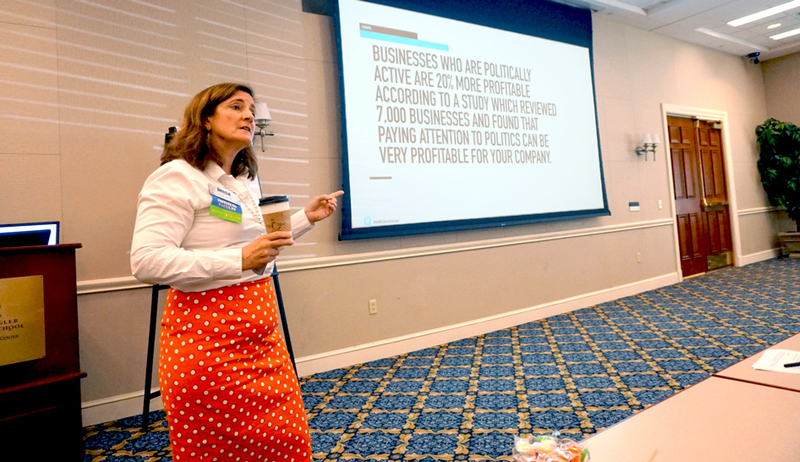 I almost said "no" to speaking at the IHRSA Women’s Leadership Summit even though I believe the event checks off virtually every box on this list of ways to help myself and the other women in the industry thrive. I hesitated before saying yes because of managing the delicate balance of work and family. However, after some self-reflection I realized, truth be told, this is the area that personally provides me with the most significant growth opportunities. So, let’s make a deal. If this article speaks to the challenges you have experienced, join me for a glass of wine at the IHRSA Women’s Leadership Summit and we can discuss how each of us can make this a priority. Have You Discovered Your Leadership Purpose? Once you connect your personal purpose to the work that you do, everything changes. The fitness industry has produced—and benefited from—many strong, pioneering women. It was hard to pick just four! We asked five fitness industry leaders (who just so happen to be women) to share their thoughts on how gyms can foster a supportive environment for female employees. Helen Durkin, JD, is the Executive Vice President of Public Policy for IHRSA. She is a champion of the health club industry and a committed advocate for physical activity, primary prevention, and public policies that promote wellness because it will take more than personal responsibility to get the world active. Helen lives to ski, dreams of knitting nirvana, is a mom, wife and springer spaniel owner.